In this digital age, sending a letter seems pretty old fashioned to most. In fact, for people born in the eighties and nineties, to write longhand is a challenge. In the instances when e-mail seems unsuitable, it is simply much easier to compose our letters on computer, print them out and visit the post office to mail them. A few weeks back, I was doing just that here in Tokyo when I noticed a metre-high white box — inscribed with the names of several well-known Japanese and international printer manufacturers — standing inside the entrance of my local post office. Don’t make the mistake of depositing your letter there. Instead, the next time your printer runs out of ink, take the empty cartridge and drop it into the white box to be recycled by manufacturers. Believe it or not, every year the Japanese alone consume around 200 million ink cartridges and unfortunately in 2008 only 10% were returned for recycling. The remainder are thrown away and in Tokyo that likely means they are incinerated. A similar story can be found in the UK, where 65 million cartridges are sold each year and the recycling rate is only 15%, with the rest ending up in landfills. Something had to be done about this terrible waste and the responsibility really resided with the manufacturers. Two hours by train north-west of central Tokyo is Lake Suwa. The region is known as “The Oriental Switzerland.” Besides the breathtaking nature, the city of Suwa is home to a highly developed precision machinery industry, including one of Japan’s most well-known computer printer manufacturers, Seiko Epson Corporation. Epson employs 10,000 people here, making the company the biggest employer in the Nagano prefecture. Recognizing the poor state of printer cartridge recycling in Japan, Epson and five other printer companies launched “The Ink Cartridge Homecoming Project”. In April 2008, recognizing the poor state of printer cartridge recycling in Japan, Epson came together with five other printer companies to launch The Ink Cartridge Homecoming Project, after a year and a half of negotiation. Through this initiative, it is possible to drop empty cartridges into white boxes at 3,639 branches of the post office nationwide. These cartridges, from Brother, Canon, Dell, Epson, HP Japan and Lexmark are then delivered by Japan Post to the Epson Mizube plant to be sorted and prepared for recyclying. The costs of the operation are shared by the project partners. The recycling plant employs 129 and has a policy favouring the employment of the disabled, with the entire plant designed to support their participation in the workforce — from the parking to the work areas, to the washrooms and canteen. “Even though most of our production lines are now situated in China, Malaysia and other Asian countries, we can still develop these kinds of jobs locally,” says Mr. Akihiko Sakai, one of Epson’s board of directors. 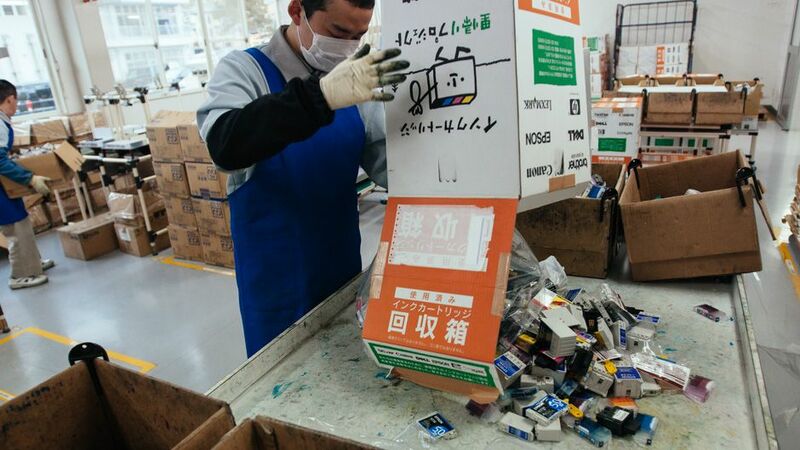 The workers separate and package the cartridges by brand so that Japan Post can ship them back to the appropriate maker, where they get refilled. Cartridges from Brother, Canon, Dell, Epson, HP Japan and Lexmark are delivered by Japan Post to the Epson Mizube plant to be sorted and prepared for recyclying. “We do have belief in an environmental friendly approach, that’s why we thought about every detail in this process,” Sakai told me. Having started this recycling project on a national scale, the partners intend to roll it out in other countries. There is obviously a long way to go in terms of ensuring zero waste from printer cartridges, but the efforts of Epson and the other printer companies are part of the solution. These innovative efforts should not stop at just recycling the cartridges. Epson printers already use the company’s patented Micro Piezo technology that not only harnesses mechanical force to reduce electricity usage, but also allows smaller designs that are less resource-intense to ship. An even further step may be Epson’s work developing a printer without cartridges (shipped in unpainted recycled packaging). A simple looking machine with slim bags full of ink, rather than cartridges, the EC-01 can print up to 8000 pages. The idea here is that, instead of buying new cartridges when your ink runs out, you return the printer to Epson, get a cash refund and pick up a new one. This forms part of Epson’s environmental vision 2050 (PDF), their latest plan to further reduce resource and energy usage. And the idea is a bit like the beer and water bottle recycling schemes we find in my home country, Germany. In the case of the EC-O1, returned machines are reconditioned for re-use two more times — resulting in a total print capacity of 24,000 pages. Will this catch on? It is hard to say. It has been called a crazy idea in some quarters and a quiet revolution in others. But perhaps we need more crazy ideas in order to have a truly green revolution. Journey Of A Printer Cartridge by Stephan Schmidt is licensed under a Creative Commons Attribution-NonCommercial-ShareAlike 3.0 Unported License. It’s out of date that writing letters. Young people send e-mails to replace letters. So they use their printer a lot. Therefore many printer cartridges are wasted. Every year, 200000000 printer cartridges are wasted, but only 10% printer cartridges are recycled. 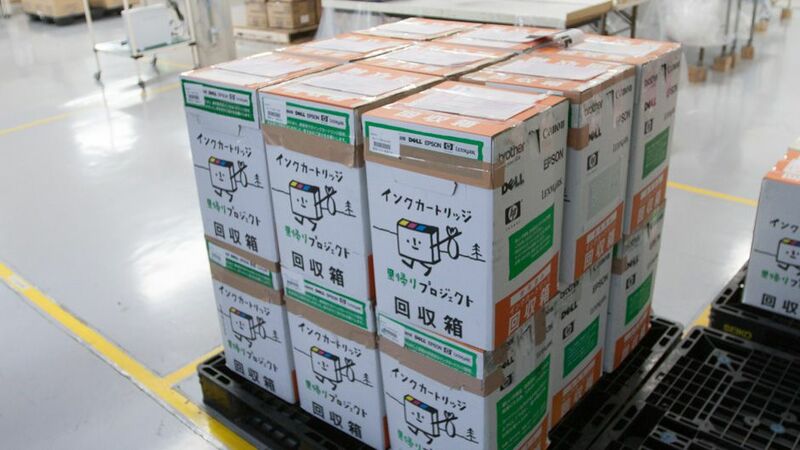 Recently, used printer cartridge are collected by post offices and sent to Epson, the largest printer company in Japan. 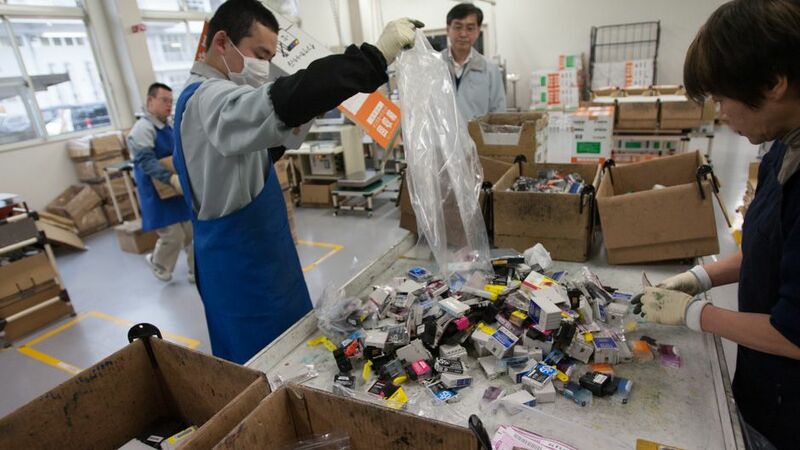 Epson persuaded other big company to cooperate in recycling. This project is called ‘the inc cartridge homecoming project’ and run smoothly. Epson let this project spread to all over the world. Many people with handicaps are employed by Epson in this recycle factory. There are some barrier-free equipment. Epson invent the printer without ink cartridge. This printer doesn’t need ink cartridge, so it’s an ecologically friendly printer. We have to consider about the Earth environmental.